I’ve completely and utterly fallen in love with Charleston. It’s one of those places that I just knew I would love even before visiting and within just a few hours of being there, it was confirmed. Thomas and I stayed at Zero George which was recommended to us by my in-laws and a handful of friends. It’s such a charming little hotel that is within walking distance of restaurants, shops, bars and lots of other activities. Even though it was warm out, we spent our entire days outside, either walking by foot or bike to explore the city. 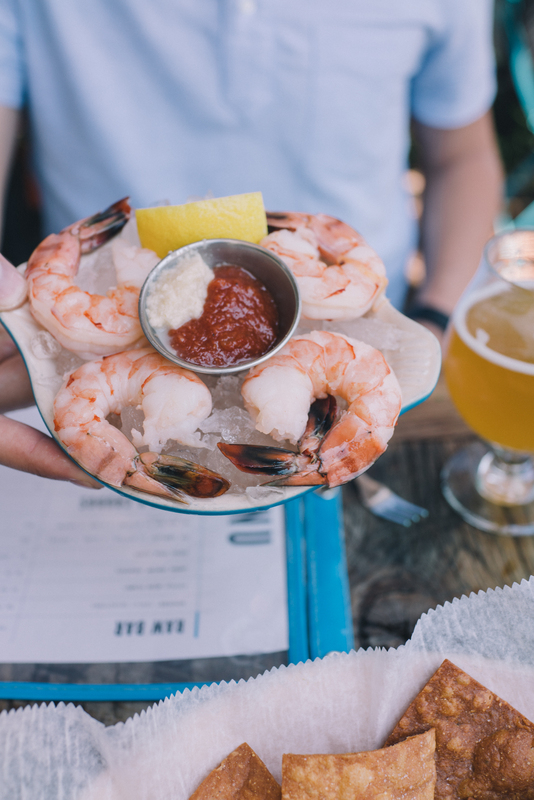 We got so many amazing recommendations from readers for food, drinks and things to do. So much that there was no way we could do it all in the three days we had, but we tried to squeeze in as much as possible! After sleeping in (aka waking up after 8am, something we hardly ever do), we got ready and headed out for the day. The minute we stepped outside from our air conditioned room, we beelined for some iced coffee at Black Tap Coffee. I could seriously become addicted to their iced lavender lattes, which were incredibly refreshing in the balmy mornings. We went back for more a few times over the following days. Charleston has some of the most beautiful homes and architecture. We spent a good while roaming around South of Broad, French Quarter, Upper King and Historic Downtown. Every few minutes we’d pick a favorite house which would then quickly be replaced by another stunner that caught our eye. Oh, and all.the.pink. So much of it! I went a little snap happy. By 2pm, we had walked up quite an appetite and were in desperate need of some ice water, so we made our way over to another highly recommended spot, 167 Raw. We quickly ordered some guacamole and chips, fish tacos and drinks, which were all so good! The very pink Mills House (above) is located right across from Husk, where we had one of the best dinners while in town. Make sure to grab a cocktail at their bar located in an old carriage house right next door! I also loved getting to peek into the quaint porches of some of the Charleston homes. Some had secrets gardens while others were lined with rocking chairs, just waiting to be sat in with some sweet tea. There were also so many #frontdoorgoals. This Paper Crown dress is bright and breezy, perfect for a summer day. I dressed it down with sandals from Mango and my newest obsession, this pink Mansur Gavriel round bag. It all started with finding this little blush Boowood one and then discovering the Mansur Gavriel one for half the price. If you love the round box style, but not the hefty price tag, there are some great vintage options over on Etsy (and I’m sure on Ebay) if you have some time to dig a little. I also found this one and this one that are similar. The dress looks perfect for a summer wedding. I love those dresses which can be worn on any occasion, you just have to switch the accessories and voila! The bag looks beautiful too, however I wonder if it’s easy to carry around since it’s quite big. That dress is gorgeous, Julia! Iced lavander latte? That sounds delicious! I loooove the color scheme of the photos, as well as your pretty summery outfit. Great post! What a beautiful, charming city! OMG!! These photos are so gorgeous! The food, the architecture, your style, everything is basically perfection! Magical, feminine and so beautiful! :) Gorgeous dress and sweet photos! I’ve heard amazing things about Charleston! I love this dress! Such beautiful colors! Loving all the shades of pink everywhere and the food looks delicious. Loving this summery dress! Perfect colors! P.s. : The food looks amazing -omg! so many beautiful pastel colours! So beautiful! Charleston is the prettiest place. And your outfit is stunning! I lived about half my total life in the south, and discovered your blog during my last year in Tallahassee, FL, my college town. I remember thinking "Wow this girl has such ladylike, feminine taste; she almost looks like a Southern belle than an SF girl." Ironically, my now-husband and I moved to SF a year later, spent two years in the city, and are now back in the South. I still agree with my Southern belle assessment from four years ago! The feminine florals, extra long lashes, perfect loose waves, pink and red hued lipsticks, and huge amazing engagement ring (your signatures– or at least what I consider to be GMG signatures!) are all things I see more in the south than I ever did in SF. Regardless of where your look "fits in" best, I am so happy you enjoyed Charleston. It really is picturesque! And you totally have me craving a lavender latte now. I haven't had one since I was in NYC for work last summer! Never had an iced one though; that sounds even more delicious for this hot southern weather! Such a great view at the Charleston all the pics are cache especially the Paper Crown Dress and the pink Mansur Gavriel round bag i LOVED the most they are so beautiful and suits you pretty much The trees, flowers and some food to eat, this will my favorite blogs to revisit again I loved the way you showcase your fashion, Thanks Julia Engel you’re really an Angel. This looks beautiful! And that food looks amazing! Love your look- the bag is too cute! Everything about this post is lovely. The fashion, your cute handbag and the amazing photography! You should write a travel book as all of your posts that feature your travels are definite inspiration to visit the places you have been to! Gorgeous photos of the city! Charleston is gorgeous! Love this look, and your dress! 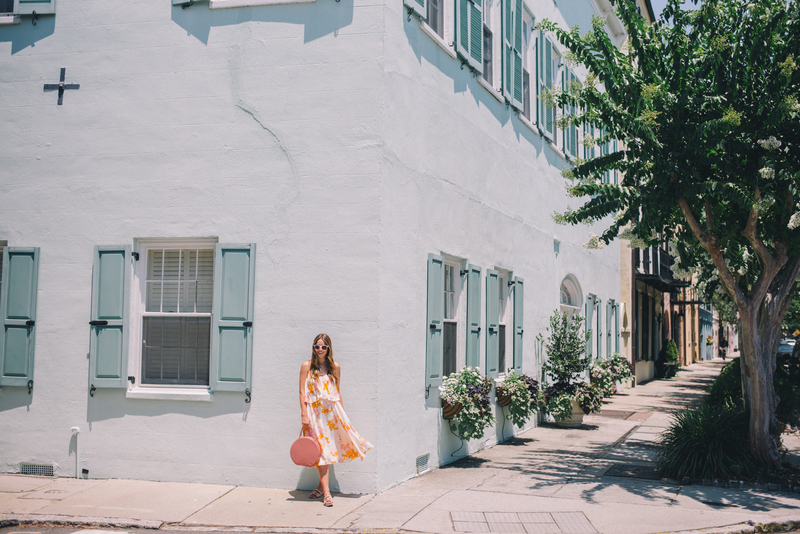 SUCH a gorgeous post – think this might be my favourite GMG post yet Julia :) Can’t wait to get to Charleston and explore too! So in love with the dress and scenery but the bag is EVERYTHING! ? Charleston is hands down one of my favorite cities in America. Looks like you did it right too! Charleston is on my list of places to see! I love the pops of pastel colors! Your Paper Crown dress is beautiful! I love this breezy dress on you and that round bag is so cute! Thanks for the affordable options. You look adorable! 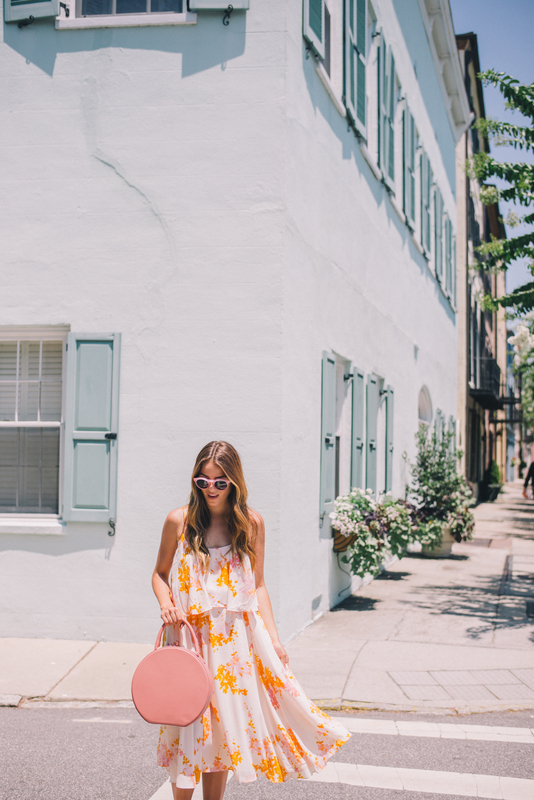 The sweetest look for an afternoon in Charleston. So glad you two enjoyed it! Charleston is such a great city! We went a few years ago and didn’t have time to do everything on our list. Sounds like you had a good time! Love your dress! This looks like a darling place! And I’m in love with your circle bag! So unique and so cute! I love the colorful getup! So cute. Charlestown is such a beautiful place! I love all the pink buildings, and they look beautiful with that dress! 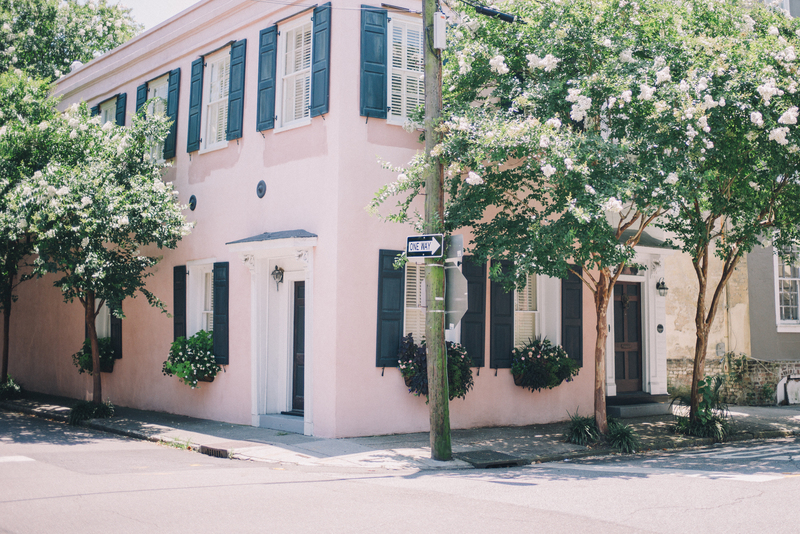 Charleston is just one of the cutest places! I love all of the colorful buildings and the sweet southern charm! Your dress fits perfectly!! And I am obsessed with that bag! Charleston is one of my favorite places in the world! I am from Columbia, South Carolina, but live in Charlotte, North Carolina with my husband! 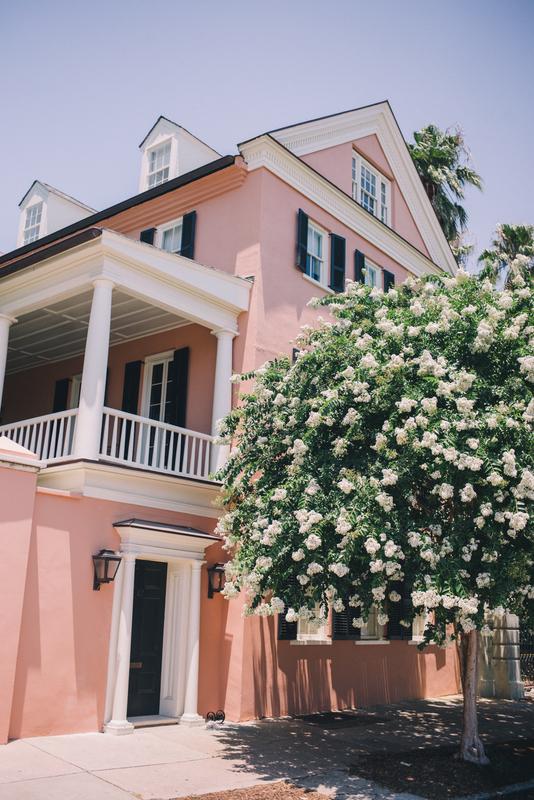 The beauty in Charleston is like nothing else and there is so much to do there! It’s a treat every time I get to go so I am really excited that you came to the South and experienced one of the most beautiful places!! So pretty! I love seeing you highlight southern cities in such a beautiful way (especially one of my favorite cities!!) Also, I love hearing about Charleston from a non-southerners perspective! It makes me want to go back for a visit! Also, your romantic pink outfit is so pretty and practical for a warm day of exploring by foot! This trip looks amazing, I’ve been dying to visit Charleston! Charleston is my second home. My daughter has a great little shop there called Dandy Boutique located on 43 John Street just off upper King. The place is in my bones for sure. My oldest daughter graduated from College of Charleston – a wonderful place. So glad you enjoyed your time there. It is a one of a kind place. I’ve heard so many great things about Charleston! These pictures are gorgeous – looks like a pastel dream. Love your dress, too! I love this post! The town looks so dreamy, especially with all the pink!! I’m loving the round bag as well, purses that hold their shape are always a go to of mine. Beautiful photography! Looks to be a lovely place. Charleston has such gorgeous architecture! You look absolutely stunning in that Paper Crown dress! Charleston is easily my favorite city in the US. The beauty of the town, the elegance, and the amazing food are second to none! The colors of this dress go so well with the pretty pastel background <3 In love with your bag! Looks like a gorgeous place. I always hear about Charleston from Grace Atwood but I love seeing it from your POV as well. Such a lovely place. I’ve never been but would certainly like to. Love your dress, and oh my goodness that food looks amazing!! This is absolutely stunning! I love your whole site. Charleston is one of my favorite places in the world. It is the sweetest little town. Such a beautiful place. I have been seeing all your IG and snaps and it looks so lovely in Charleston! Love this dress and your circle bag! The colorful buildings are stunning!! That dress is so pretty, I love Paper Crown designs. 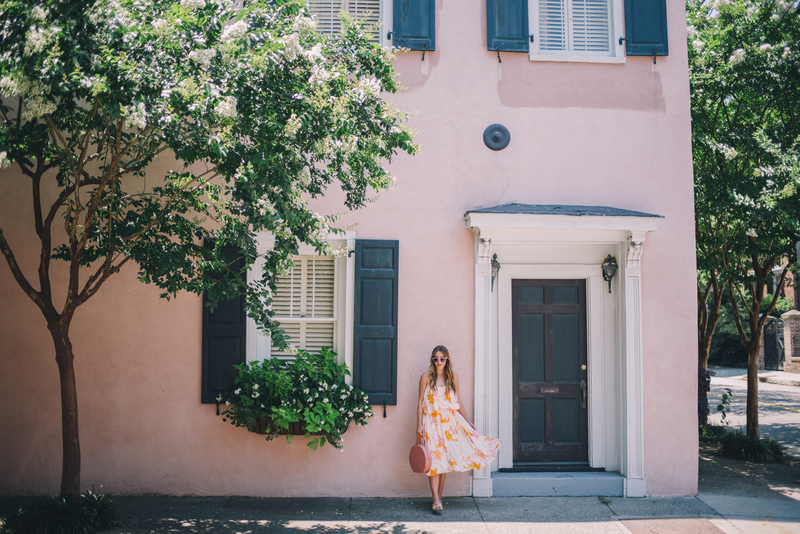 Love this dress and that beautiful pink building is the perfect backdrop! Beautiful dress!!! Beautiful location! I have never been to Charleston but have always wanted to! Thanks for sharing- now I NEED to go! If you like lavender lattes, check out Collins Quarter when you’re in Savannah. They do amazing avocado toast too! Wow, I love the pretty soft colors of Charleston! Your dress is also very cute! It’s perfect for the summer! I’m so glad you got to experience Charleston. I have been following your blog for awhile and always wondered if you had visited CHS. It’s my favorite city in the U.S. My husband went to The Citadel and even asked me to be his girlfriend at the Magnolia Plantation, so I remember many charming visits. I love living vicariously through your posts (so wishing I was there again). Cheers! Charleston is SUCH a charming city!! 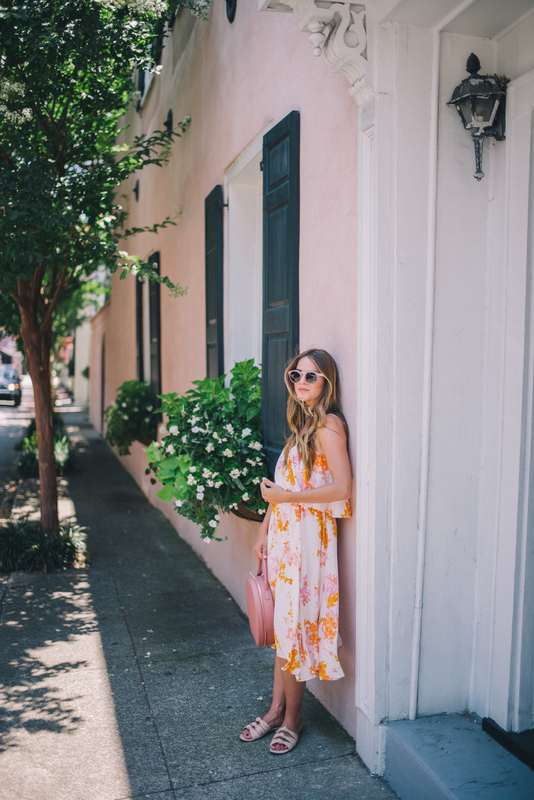 This pink and orange printed dress is perfect for the streets of Charleston. Beautiful photos as always. This dress is absolute perfection! Glad to hear you enjoyed Charleston..it’s one of my favorite cities! So much to see and do! Iced lavender latte sounds soooo good!? Such a gorgeous photos, looking forward to seeing more from your trip! We’ve lived in Charleston for almost three years now (having moved from San Diego), and, although I’m not sold on living here, it really is a fun place to have people come visit. You made some great food choices! The bar at Husk is adorable–one of the first spots I went with a new girlfriend here. I loved how antique it was–I felt like we were back in the 1800’s on Queen Street. Such a beautiful post! I went to Charleston 10 years ago and I have been dying to go back. This post sold me on moving it up to the top of my list! Ah! I was in Charleston this past weekend as well. Aren’t the views absolutely stunning? I couldn’t get enough. Also your chips and guac looks AMAZING! Yum!! Gorgeous photos! That dress is absolutely beautiful on you – I love the colours of it! 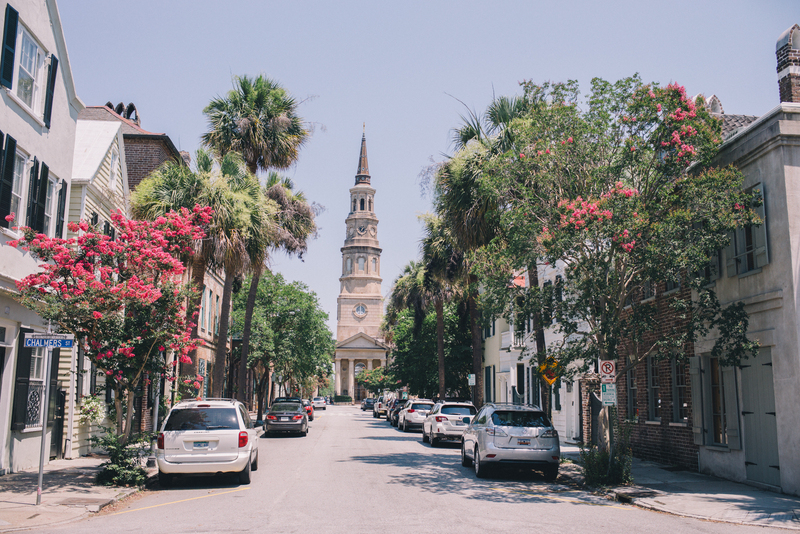 Plus, Charleston looks like a lovely place to visit! You’ve definitely talked me into putting it on my list! 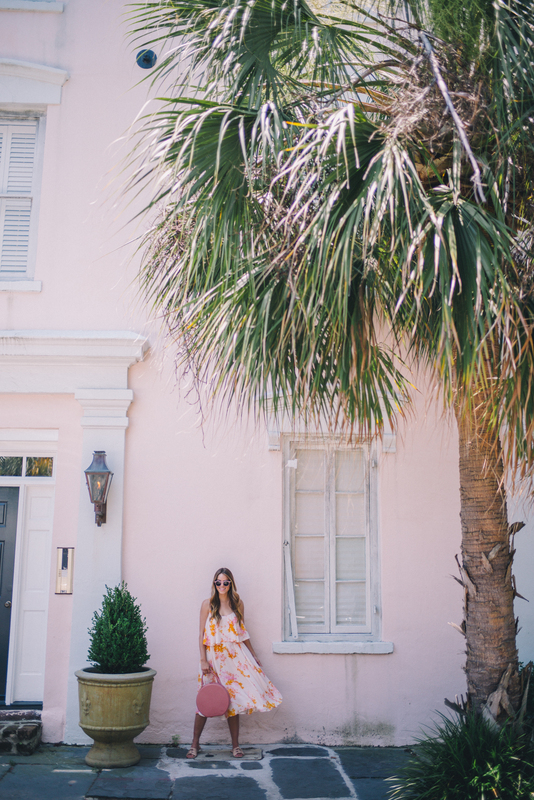 Charleston is such an amazing and colorful city! There’s so much to see and do there. Def one of my fav cities! Loving all your pics! It just looks so perfect and cute there! Charleston is def a place that is a consideration of a place to move! Love everything you wear , esp, the crown dress. Charleston looks so cute! loved all your Snaps! I love the fluidity of this dress, its vibrancy, and simplicity. So glad y’all took some of our suggestions to heart! Black Tap is one of my all time favorite local coffee spots. Hope y’all are having a blast on your Southeastern coastal tour! Oooh the bag is so cute! I love the colors of the buildings as well, must be a blogger’s paradise. Well I already knew I was dying to visit Charleston, but after reading this post I am even more determined!! Although ALL of your posts are beautiful and I love seeing how you style outfits, I really enjoy your travel posts & guides the most! Please keep making them! I’m curious if you’ve been to many other places in the South. I haven’t been to many, but on my bucket list (along with Charleston) is Nashville, Austin, and New Orleans. I love your beautiful bag. After seing this post and the pictures Charleston has for sure been added to my bucket list! Love all the colors-especially pink! Beautiful pictures and such a pretty dress! I now live 2 hours from Charleston but haven’t been yet. I’ll have to check out that restaurant, the food looks SO good! I went to Charleston back in February and stayed at the Mills House- which I love! I’m headed down again next weekend for a bachelorette so another fun time in the near future in one of my favorite cities! Absolutely stunning photography!! I’ve been wanting to visit Charleston for a while, and have heard such wonderful things. Sounds like a fun trip!! Where are the sunglasses from? I heart pink! Love Charleston. So charming and pretty. Hope you go to the plantations next time. I love all the pink houses!!!! <3 So pretty! And you look perfectly dressed for the hot and humid weather SC has to offer. I loved living over on the east coast, and practically lived in flowing dresses like that one, so cute and good for the heat! 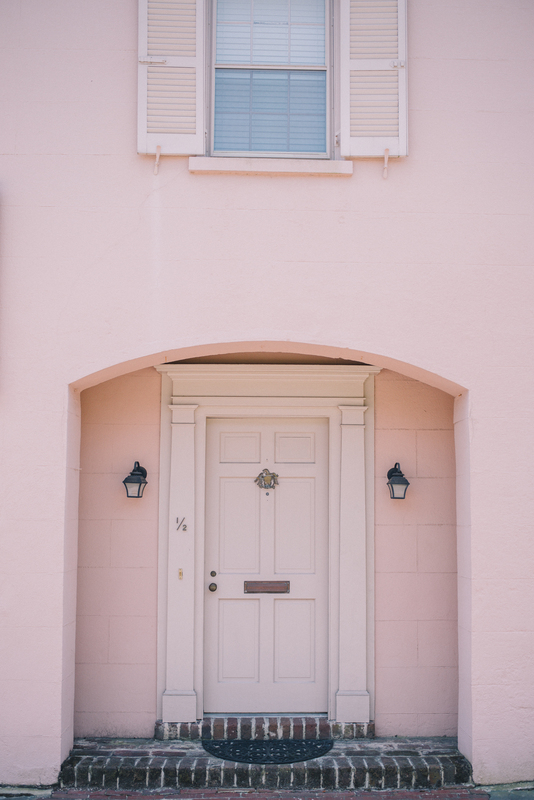 Thanks for sharing your (pink) snaps of Charleston! These images are amazing. I love them all! I’m going straight to buy that dress. Thank you! I loveee this dress plus the food looks delicious! Your dress is adorable, and just perfect for the surrounding! The rocking chairs on porches with sweet tea sound just dreamy – makes me really want to plan a trip down South! This bag is beyond beautiful! Love the color.